Core Jeet Kune Do is an advanced training methodology for self-defense in all the ranges against single and multiple opponents with or without weapons in a variety of environments. Because it's important to some people to know who I've trained with in the past, near the end of this page are pictures of me with some notables. You shouldn't have to guess too hard on who they are. I dislike posting this sort of thing (the images below) simply because I believe a man's (or woman's) functionality comes from the individual. When you are in a fight your earlier instructors aren't there fighting with you or for you. I've seen far too many people training with good instructors, but they, themselves can't do a damn thing. But they sure can talk. Too many people name-drop at the drop of a hat, with the intent to make you impressed or to garner a certain social standing or to stroke their ego—because that's often the only thing they have left in life. Strive to be your best, speak humbly, and listen more than you talk. Wise words from a lot of different people in my past. They know who they are. 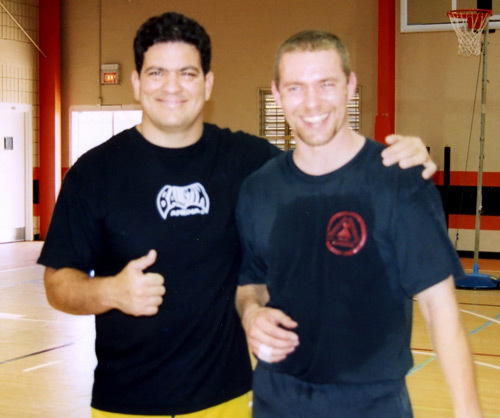 I started my training in Jeet Kune Do in 1979 with my older brother who had gone from his tour in the army to train at the Kali-Jun Fan Academy in California, specifically training under Richard Bustillo. 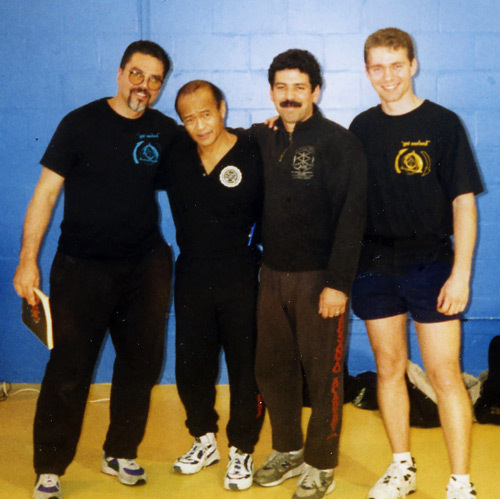 The Kali-Jun Fan academy was the center for Jun Fan Gung Fu and Jeet Kune Do at that time. Years were spent testing myself (sparring and fighting) against a variety of people who were trained in other martial arts. They hailed from Okinawan Karate, Goshin-Ryu, Tae Kwon Do, Kenpo, Hapkido, Aikido, Shotokan, Ninjutsu, boxing, wrestling and other arts. 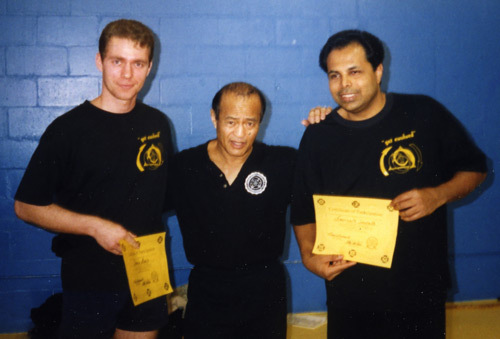 My formal training under the Inosanto lineage in Jeet Kune Do Concepts began in Florida around 1997. 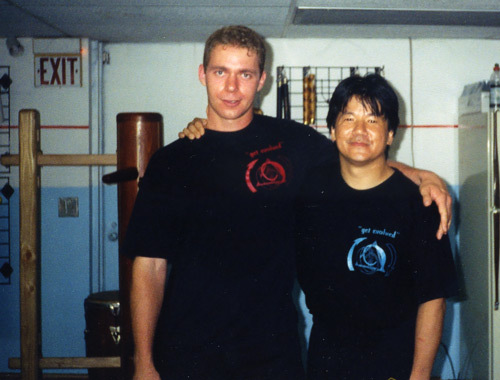 Within a year, I was teaching there, specifically the Wing Chun and then later the other curriculums, Savate, Jun Fan, Pentjak Silat, Kali-Escrima-Arnis, Muay Thai, and grappling, primarily Combat Submission Wresting (Erik Paulson). The JKD Concepts lineage training consisted of each of those different martial arts trained separately during each of the 3-4 hours of training per night and then we had weekly sparring. I’ve had nearly 30,000 hours of training, research, and development to help shape Core JKD into what it is today. The methods I teach—especially when stated they are Core JKD specific—are foundational methods that work regardless of the skill of the opponent or resistance level they present you. That’s the refinement of well over 35 years of hard research, beatings, sparring, and levels of opponents (and attackers) that range from highly-skilled national champions and military and law enforcement to the street thug who has one thing that works well for him or her in weight classes ranging from 300lbs to 98lbs. That’s my history. That’s the crucible of Core JKD. My specific, detailed research and methodical refinement of foundational techniques against resistance that—quite simply—aren’t found anywhere else. The stuff I don’t show, but mention, and the stuff I do show, but may not mention. You will also see me present some training in Wing Chun (Core JKD's version is called Rebel Wing Chun), Silat, etc and in ways that are familiar, but different enough to let traditional purists get mad at me and others see that—hey! This can actually work when it’s not bound by the traditional mentality and lack of training against resisting attackers. That’s kind of where Bruce Lee was coming from. That’s why he will always be revered by us.